IPS Inter Press Service: ALTAGRACIA, Nicaragua, Sep 7 2015 - A group of poor women from Ometepe, a beautiful tropical island in the centre of Lake Nicaragua, decided to dedicate themselves to recycling garbage as part of an initiative that did not bring the hoped-for economic results but inspired the entire community to keep this biosphere reserve clean. It all began in 2007. 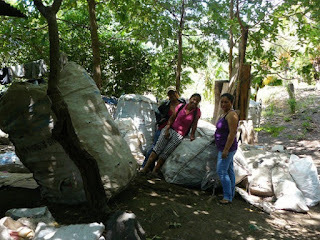 María del Rosario Gutiérrez remembers her initial interest was piqued when she saw people who scavenged for waste in Managua’s garbage dumps fighting over the contents of bags full of plastic bottles, glass and metal. How much could garbage be worth for people to actually hurt each other over it? she wondered. She was living in extreme...read on.